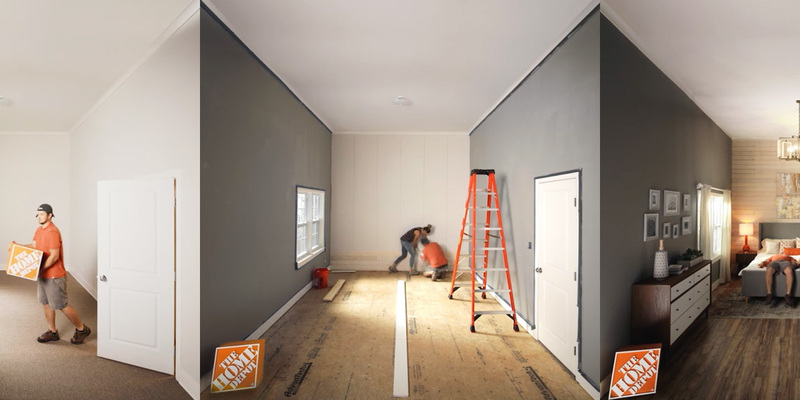 A compact new Pinterest campaign from The Home Depot and agency 22squared offers sprawling home improvement guidance, hoping to help move DIYers past inspiration and into action by showing them how the work actually gets done. Titled “Built-In Pins,” the promotional effort includes videos, images and a 360-degree interactive online shopping experience created with virtual reality advertising platform OmniVert—all tailored to fit the dimensions of Pinterest’s mobile platform, itself a popular source of visual ideas, including for interior design. The various ads show makeovers of four key rooms—bedroom, kitchen, living room and bathroom—as performed by a bootstrapping couple. Time-lapsed little film clips, served in Pinterest’s own format, are the perfect way to make something look easy, when surely it’s not. In just 30 seconds, a man and a woman overhaul an entire space, stripping out the old carpet, painting three walls and paneling a fourth with shiplap siding, laying down hardwood-style laminate floors, putting in a light fixture, and furnishing the whole place. To that end, the campaign’s Pinterest posts also include guides and tip-sheets on the methods pictured in the videos—like a how-to for installing beadboard backsplash behind your kitchen stove. The answer is, apparently, with a measuring tape, a nail gun and some caulk … though it’s still hard to imagine the process isn’t a bit more complicated than that. In other words, it unsurprisingly falls more on the side of inspirational eye-candy than bonafide step-by-steps on how to make your dream home a reality using just a little elbow grease and the friendly neighborhood hardware chain (where underpaid employees may or may not, without offering help, let you wander around for a half hour looking for the right size toggle bolt, and scratch their heads when you do ask). While the campaign certainly makes the “doing” part clearer than would a glossy snap of the finished product alone, it also does a good job of making sure the process look like an awful lot of fun and sunshine—as opposed to say, sweaty, frustrating or protracted. That is to say, it’s still advertising. It’s just selling a slightly different, and to be fair, slightly more honest, kind of magic.